THE planned demolition of a care home for disabled youngsters in Northumberland has been put on hold. Doubt rose over the future of Ponteland Cottage & Rural Enterprise Village after plans emerged to build 54 private homes onthe site. Campaigners concerned at what might happen to the 46 disabled people currently cared for at the village have now won a stay of execution after a planning committee refused to condemn it. Councillors on the council's Area West Planning Committee deferred a decision until after they have had chance to visit the site themselves. Ponteland Town Councillor David Butler, who has been campaigning to keep the facility, said: "We are pleased that we got the site visit because it gives us the opportunity to speak to the county councillors on site. "The village is very popular and people who are there now would have to find alternative premises if the application goes ahead. Another problem would be traffic congestion in Ponteland. It is already bad in the village." The 26-year-old safe haven, on North Road, includes its own cafe, restaurant and shop, and was opened by Princess Alexandra in 1984. Despite its importance, plans emerged to replace it with private housing, including 20% affordable housing, plus a 10-patient dementia unit. Self Unlimited, which runs the facility, says with funding raised from redeveloping the site it would work to find residents, some of whom have been there since the 1984 opening, suitable alternative accommodation. It has presented a list of options elsewhere in Northumberland. Campaigners worried about the fate of the current residents say the rebuild would also cause impossible traffic problems in Ponteland. Erik Whitehouse, executive director of Operations (North) for Self Unlimited, said: "The site is not sustainable for the future for the people who live there. "The vast majority are supportive of the changes and so are the family members involved. So is Northumberland Social Services. 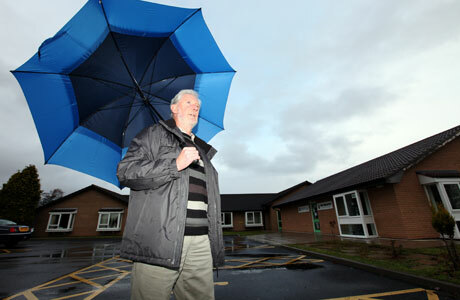 Northumberland desperately needs a new dementia unit. To enable us to do that we need to redevelop the site." At the planning committee meeting, Coun Anne Dale said: "Because it's such a big development, and with a big change, I suggest a site investigation."